He said, “The bird suddenly turned to an old woman of about 80. People were shocked as they saw the woman rolling on the road and blood gushing out from her forehead. It was learnt that as the woman was about to be lynched, the traditional ruler of Layeni Community, Baale Rafiu Olayeni, arrived the scene and pleaded with the angry people not to take laws into their hands. Olayeni told our correspondent that he called the Divisional Police Officer of Layeni Police Division, CSP Chijioke Ndu, and he drafted anti- robbery policemen to the scene, rescued the woman and took her to the station. Hundreds of spectators were said to have followed them to the station. At the station, however, the police found it difficult to control the mammoth crowd that had come to see the alleged witch. It was learnt that the DPO had to call for reinforcement from Ajegunle and Amukoko divisions before he could handle the crowd as some people were bent on lynching the woman. The policemen were said to have fired tear gas at the crowd and dispersed them from the station. 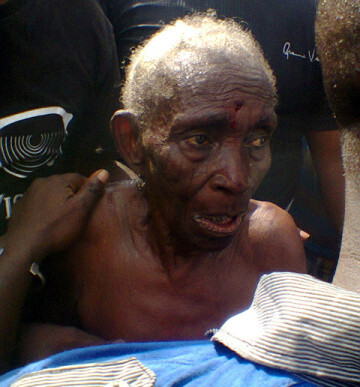 It was learnt that the woman was subsequently transferred to the Area B Command in Apapa for further investigation. It was gathered that this was the seventh lynching the police had prevented this month. This entry was posted in General Emotions for singles, dating, married, Divorced, Men, Relationships, Women and tagged Woman Saved By Police After Mob Almost Killed Her By Tagging Her A Witch.